Everyone knows the name Neiman Marcus. The name is synonymous with fine fashion. 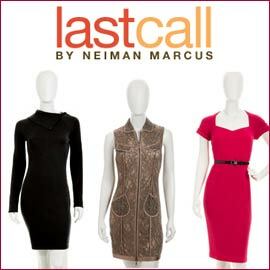 If you pass up the store or the website, thinking that the clothes there are out of your price range, then you may want to visit Last Call by Neiman Marcus. The Last Call website is loaded with discounted product from names such as Juicy Couture, Anne Klein, Dolce Vita, Shelli Segal, Michael Kors, Ali Ro, Marc New York and others. Many of the dresses are still a bit pricey, but they are deeply discounted from their original prices. The selection is quite extensive, including jersey dresses, tank sheath dresses, belted Jacquard dresses, draped-neck dresses and more.